Bonefish on the Brain Bonefish and all that relates (maybe a bit about tarpon too). 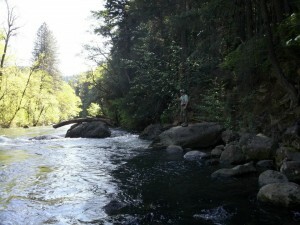 After fishing the McCloud for a full day we stopped by the Upper Sac in Dunsmuir to assess the river. It was high, but not tooooo high and, in the fading light of dusk, the sky was full of stone flies. These weren’t the little dark stones of winter or the bright little Yellow Sallies, these were the big boys, the Pteronarcys Californica, the Giant Stonefly. I quickly put on a big, massive foam stonefly and had a few grabs before the light faded. I knew we had to get to dinner anyway. My folks bought dinner for Matt Hansen and I and then Matt bought a few more beers afterwards (on the drive back I got word that my divorce was finalized, so, we were celebrating), all at the Dunsmuir Brewery Works, which I like because it is open late and, well, its a frigging brewery. What’s not to like? Matt liked the Pale Ale, I dug on the Porter and we both had enough that we had some sore noggins in the morning. After I made some Mother’s Day breakfast we set off for the river. The river was indeed high, but Matt started off the party with a little bow followed by a nicer one. The Upper Sac in high water is not unfishable unless the water is off-color. High water just means the fish are out of the riffles and sitting on the seams in the more protected and slightly deeper water. You find those places, you find fish and we found fish, although the number of places we had to fish was greatly reduced. 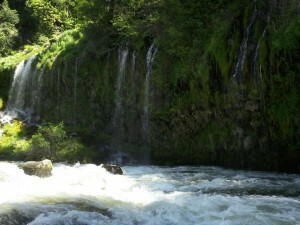 The Upper Sac is a wonderful river. It has about 40 miles to fish and has access to just about every single bit of it. Railroad tracks and the highway see to that. Because of the access and the tracks and the highway, it doesn’t maybe get the respect that more remote locations get. It’s too easy to get there. If you are fishing the Big Hole, odds are you either drove there or flew there and it took a long time. It took the opening of wallets and dedication of time. To get to the Upper Sac you just drive up the highway… 4 hours from San Francisco. Still… it is beautiful, even in high water when the fishing is compressed and you can’t get in and wade around the place like you can in mid July. We hiked up to Mossbrea Falls and then decided to head back South. It was a good day on beautiful water. The fish were there, but largely stayed hidden in the bigger water, despite those massive, impossibly large awkward flying stones that passed by like slow moving hummingbirds. Had a couple grabs on the big bug, but the fish were largely elusive. We had a few fish to hand, but nothing big and not too many. Such is the fickle river. Maybe she was a little upset that I waited until May to visit her. She’s open all year now and must have noted that I fished Cuba before I fished the Upper Sac in 2012. Sorry honey. Mossbrea Falls… part of it, anyway. A great trip. 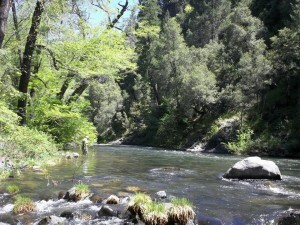 The McCloud, the Upper Sac… my rivers. I miss them and I look forward to seeing them again. This entry was posted on Friday, May 18th, 2012 at 1:04 am	and is filed under Fish Tails, Locations. You can follow any comments to this entry through the RSS 2.0 feed. You can leave a comment, or trackback from your own site. Looks like a little extra water coming over the gravel bar at Mossbrae. Last time my buddy and I were in Dunsmuir Brewery we brought ice cream to have on the home made pie. No better cap to a day fishing the Uber Sac. Give me a call next time you head up. Ya know, it was high, but not too bad. Love that place. So, what’s all this about?? Wanna Subscribe? You can do that. © 2019. Bonefish on the Brain. Powered by WordPress. Cleanr theme by WPShoppe.